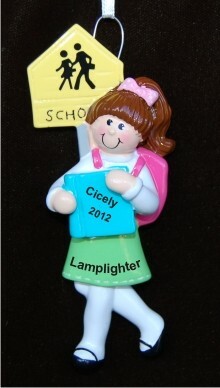 Parents choose the perky brunette school girl personalized Christmas ornament as a first day of school gift for starting middle or high school or entering a private school. The design of these kids ornaments personalized from Russell Rhodes is darling, and the decoration will become a treasured keepsake with the addition of her name, the year and the school name too. Our lettering artists will add the details by hand in an font more attractive than the one shown for clarity. These school ornaments are easy to display with the cord we attach. The female brunette school girl personalized Christmas ornament will bring delight with it when arriving in our custom velvet drawstring pouch.